Small Printers for the cardmaker. Small Printers for your cardmaking needs. 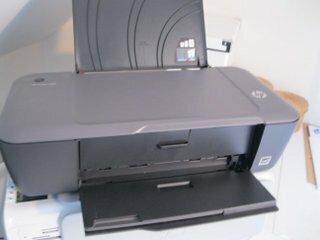 You will find a vast choice of small printers and you are sure to find one in your price range. And as a cardmaker you will probably put one to very good use for all the digital papers and wonderful characters that are available to you on the CD's that you may buy ... or even some of the F-R-E-E ones. It doesn't need to be expensive, it just needs to do what you want it to do. I use mine daily for the digital papers I store on my computer, and I go through a lot of ink. So one of the things to consider before you buy is the cost of the replacement ink cartridges that you will need. One of my printers will only take a thin card through it, but Julie from the UK has been searching around for one that will take card up to 300gsm. 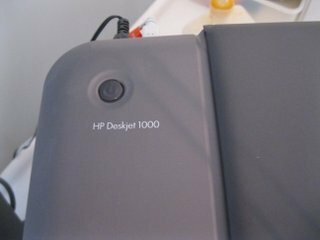 She has found one in the HP Deskjet 1000 at an excellent price. I have looked a the reviews for this machine and they are excellent, so it's well worth a look. 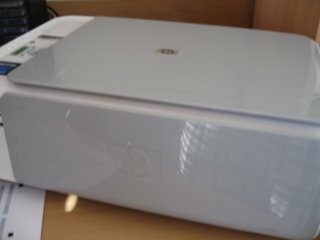 This is a fabulous little "No frills" printer that loads from the top. 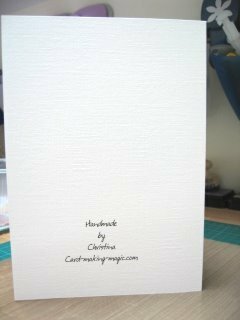 It is a bit noisy, but it means you can run your cardstock through it and add your own personalised logo to the back of your cards. Both of my printers are inkjets, and both are used with laptops. The only difference between the two types is that one takes the paper from the bottom and rolls it through to print it, and the other is loaded from the top. They are easy to use and relatively good for ink cartridges. The guarantee on your printer could be invalidated if you use ink cartridges that are not manufactured by them. But my printers are well past the guarantee date and I now choose to buy compatable ink to use in mine, with excellent results I might add. So choosing one is your decision but, together with the free software that is also available to you, I am sure you will have some fun printing off all those lovely digital papers for all your cardmaking needs.